Holiday Inn Express Hotel Saint - Hyacinthe features an indoor pool and a fitness center. A computer station is located on site and wireless Internet access is complimentary. This hotel offers access to a business center. A complimentary breakfast is offered each morning. Event facilities measure 1380 square feet (124 square meters). This eco-friendly hotel also offers multilingual staff, laundry facilities, and dry cleaning/laundry services. Onsite self parking is complimentary. 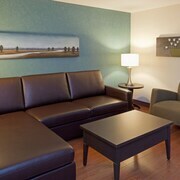 Holiday Inn Express Hotel Saint - Hyacinthe is a smoke-free property. Situated in Saint Hyacinthe, this eco-friendly hotel is 1.6 mi (2.5 km) from Les Saline Park and 2.1 mi (3.4 km) from Saint Hyacinthe Public Market. Saint Hyacinthe Golf Club is 3.4 mi (5.4 km) away. Along with an indoor pool, this smoke-free hotel has a fitness center and a business center. Free buffet breakfast, free WiFi in public areas, and free self parking are also provided. Additionally, dry cleaning, laundry facilities, and a 24-hour front desk are onsite. All 94 rooms provide conveniences like refrigerators and coffee makers, plus free WiFi and TVs with cable channels. Other amenities available to guests include free local calls, hair dryers, and ironing boards. Holiday Inn Express Hotel Saint - Hyacinthe offers 94 air-conditioned accommodations with coffee/tea makers and hair dryers. Premium cable television is provided. Bathrooms include shower/tub combinations and complimentary toiletries. 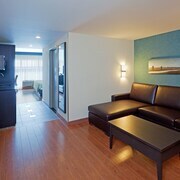 This Saint Hyacinthe hotel provides complimentary wireless Internet access. Business-friendly amenities include desks and phones; free local calls are provided (restrictions may apply). Housekeeping is provided daily.